As a leader in quality STEM education programs in Northwest Ohio and a NASA Lifetime Educational Partner, Challenger Learning Center of Lake Erie West is proud to offer quality distance learning opportunities! Our presentations have included groups from across the nation and even as far as England! Presentations are delivered via a web-based conference system. Our staff of qualified educators will work with you to set up the connection and deliver the presentation and program. Some programs include an optional hands-on component to be included with the presentation or for the educator to implement in the classroom after the presentation. All you need is an Internet connection, computer with a webcam, projector and a screen! Please call us to discuss the pricing for your classroom and schedule your next distance learning program! Expand your students' horizons with this presentation on careers in aerospace technology! Do your students wonder how to become an astronaut? Do they want to know what skills are needed to be the explorers of deep space? Students will have the opportunity to learn about the wide range of careers in aerospace and related STEM career fields. Inspire the next generation of astronauts with this presentation! In this presentation students will learn the basics of planetary and lunar science! Students will also learn about the next steps NASA is taking to explore deep space and how the moon will play an integral part in the journey beyond! We bring this program right to your classroom! A highly qualified science educator will provide this inquiry based experience right into your classroom. Our programs are aligned with Ohio's New Learning Standards. This program provides students with an integration of Science and Social Studies while they are taken through a journey through the History of American Space Flight. Students will love this interactive presentation while getting to know Galileo, Isaac Newton, Jules Verne, and Robert Goddard. In addition, they will also learn about Projects Mercury, Gemini, Apollo, the Space Shuttle, and the International Space Station. They will also have the opportunity to discover more about telescopes, laws of motion, and the future of NASA. Learn what happens to astronauts when they are in space dealing with fitness, nutrition, sleep patterns, balance, radiation, pressure, and temperature. Students will be engaged in this educational experience that provides insight into survival in a dramatically different habitat while promoting further questions about future research of Life Science in space. Next stop: Mars! How will we get to Mars? What will we need on our journey and how long will it take to get there? FInd out the answers to these questions and more in our presentation on the Journey to Mars highlighting NASA and its commercial space partners steps to land humans on the Red Planet! What is the SLS? How is the SLS going to take us to Mars? What is currently being done to make the SLS a reality and be the largest space launch system in the history of space exploration? Find out the answers to these questions and more in our interactive program on NASA's Space Launch Systems (SLS)! Celebrate the excitement of landing on the moon for the first time with our journey through the Apollo space program! Students will gain valuable insight into the historical, social and political climate which helped launch the program and achieve the goal of landing on the moon. Do your students have what it takes to create their own space transport vehicle? Explore the history of the Space Shuttle program! Students will learn the basics of space shuttle designs and how these designs are being implemented in the new Space Launch Systems. 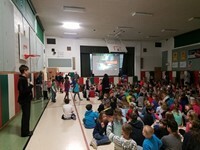 The Challenger Learning Center of Lake Erie West offers distance learning opportunities that will bring the excitement of a simulated space emergency into your classroom. True to the Challenger Center philosophy, this simulation emphasizes experiential activities that promote teamwork, problem solving, communication and decision making skills. The "Tiger Team" seeks to find the solution to a simulated water emergency aboard the space transport vehicle, a similar task to the oxygen emergency that faced the crew of Apollo 13. Your students will devise solutions, test these solutions, modify and retest as needed, and instruct the spacecraft commander as to the implementation of the solution.